Imagine living in a home with no energy bills (except the delivery charge). There are now numerous net-zero homes in Maine. This means that the home generates as much energy as it consumes over the course of the year. Sundog Solar can help size a solar system for a net-zero home and work with architects for a seamless solar installation process. In Maine, with our long heating season, net-zero homes are typically more energy efficient than typical homes. Air sealing and lots of insulation help prevent heat loss in the winter. These homes may use rigid foam, blow-in cellulose, spray foam, mineral wool, or spray foam insulation. Meticulous air sealing helps prevent draft, for greater home comfort and energy conservation. Gaps and cracks in the home exterior allow unheated air to enter, wasting energy. In some cases, builders use a blower door test to ensure that the home is virtually airtight. Heat recovery ventilation systems are often installed to promote indoor air quality and prevent moisture issues. Most net-zero homes have an on-site renewable energy system to generate electricity. In many cases, solar energy is used, and Sundog Solar can help. It is important to properly size the solar PV system to ensure that it generates as much energy as the home consumes over the course of the year. If the home is on the power grid, it can feed excess power on sunny days. During nights or in cloudy weather, the home pulls power from the grid. If the renewable energy system produces at least as much energy as the home consumes, it is considered net zero. Net-zero energy homes have grown in popularity in recent years and this largely driven by environmental considerations. Many of net-zero homeowners want greater energy independence and to reduce their reliance on fossil fuels through a dynamic combination of energy efficiency and on-site renewable energy production. It is essential to properly size a solar system for a net-zero energy home. An oversized solar system is more without producing more value to the homeowner. An undersized solar system will not produce as much energy as the home consumes, causing the homeowners to fall short on their goal. 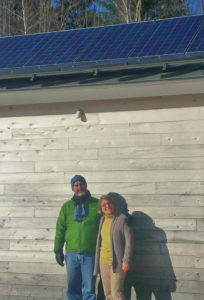 Sundog Solar is skilled in sizing solar system in Maine for net-zero energy homes properly. Our team contains NABCEP-certified solar installers and licensed electricians. Want to speak to the Sundog Solar team about installing a solar system on a net-zero energy house? Contact us today at 207.548.1100!